DEFINITION/PURPOSE: Provide legal advice to the Fort McDowell Yavapai Nation Tribal Council, tribal departments and economic enterprises. Represent the Fort McDowell Indian Community in matters brought in state and Federal court. ESSENTIAL FUNCTIONS: Essential functions may include the following tasks, knowledge, skills and other characteristics. This list of tasks is ILLUSTRATIVE ONLY, and is not a comprehensive listing of all functions and tasks performed by positions in this class. TASKS:Serves as legal advisor to the tribal council, tribal government departments and economic enterprises; Provides legal advice and analysis of tribal, state and Federal laws and regulations; Drafts and revises the Tribal Constitution, Law and Order Code, other tribal laws, ordinances, and policies; Works at hours and times outside of normal business hours and days; Drafts, reviews and recommends changes to contracts; Reviews other agreements, proposals; Represents the Fort McDowell Yavapai Nation in state and Federal court actions; Performs other duties as assigned or required. KNOWLEDGE/SKILLS:- Knowledge of the Fort McDowell Yavapai Nation Constitution, Law and Order Code, Arizona Revised Statutes, Federal Indian Law, Indian Civil Rights Act, Indian Child Welfare Act, Tribal Case Law, Federal Rules of Evidence;- Knowledge of contract and employment law;- Knowledge of state and Federal court protocol, proceedings, and practices;- Knowledge of legal research utilizing books and electronic research systems;- Skill in interpreting and applying complex laws, statutes, ordinances, and rules to the facts and evidence in individual cases;- Skill in drafting complex court orders;- Skill in managing a high case load consisting of a variety of case types;- Skill in utilizing a computer and in software capable of word processing;- Skill in establishing and maintaining effective and cooperative working relationships with other departments of the Fort McDowell Yavapai Nation, state and Federal officials, departments, and agencies. MINIMUM QUALIFICATIONS/EDUCATION:1) An attorney licensed to practice law in the State of Arizona; 2) Two years experience as a trial attorney or advocate; 3) Current AZ drivers license and meet FMYN insurance standards. INDIAN PREFERENCE:Preference will be given to qualified applicants who are members of federally recognized Indian tribes. To be considered for Indian Preference, you must submit your Certificate of Indian Blood (CIB) with your application. Under general supervision of the Deputy General Counsel, provides legal review and advice to the Salt River Pima-Maricopa Indian Community (SRPMIC) government. Ensures that applicable laws are followed so that tribal sovereignty is protected and enhanced. Provides assistance to avoid or prevent expensive legal disputes and litigation and protects the Community’s legal interests. This class is treated as FLSA exempt. Graduation from accredited college or university with a Law Degree (Juris Doctor) and three (3) years of experience as an attorney involving the legal affairs of Native American tribes. Experience that has provided knowledge of social and economic conditions of tribal governments is essential. Assignments (positions) requiring specialization in realty, enterprise (or other specializations) legal matters require previous experience in same. Membership in a State Bar and the ability to practice in Federal District Court is required. If not a member of the Arizona State Bar, must be willing to take and pass the Arizona State Bar Exam within one year of employment with the Community. Must attend a minimum of 15 hours annual continuing legal education as related to job and approved by supervisor. Advertised salary is the full range. Salary will be commensurate with experience and qualifications. SRPMIC offers a rich benefits package with too much to mention: Health Insurance, Prescription Drug Coverage, Vision Care, Dental, Paid Life, Employee Assistance Program, 401(k)Plan, Accrue 15 Paid Annual and 15 Sick Days Your First Year, 13 Recognized Holidays and more! First-year law student Dallin Maybee, recently won Best of Show in the 86th Annual Santa Fe Indian Market, one of the most prestigious Indian art shows in the country, for two children’s books that he wrote, illustrated, and covered in beading. The story and photos, which are available at http://www.law.asu.edu/ under Headlines, recently ran in The Arizona Republic, and are posted on ASU’s Graduate College Web site at http://graduate.asu.edu/profiles/dmaybee.html, where he is featured in the flash show of “Outstanding Graduate Students” on their home page http://graduate.asu.edu/. 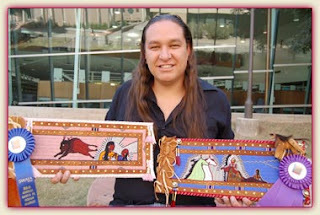 Dallin Maybee, a first-year law student at the Sandra Day O’Connor College of Law at Arizona State University, recently won Best of Show in the 86th Annual Santa Fe Indian Market, one of the most prestigious Indian art shows in the country, for two children’s books that he wrote, illustrated, and covered in beading.Maybee, 33, was raised on the Cattaraugus Indian Reservation in Western New York. His father is Seneca, his mother Northern Arapaho, and he is descended from a long line of well-known bead workers and doll makers, including his uncle, Bob Spoonhunter.But Maybee first became famous as a traditional dancer, starting at 13 and joining a traveling group that performed throughout region. He has since performed across the United States and in China, Mongolia, Europe, the Middle East, Ecuador and Chile.Eventually, Maybee became part of the American Indian Dance Theater, performed at Kennedy Center for the Performing Arts, helped choreograph and performed in the 2002 Winter Olympics Opening Ceremonies, and performed in one of the first Native operas last year in Omaha, Nebraska.He began doing beadwork to make his own regalia for dances. One year, he went to the Santa Fe Indian Market and was “blown away” by the caliber of the beadwork and other arts, and began entering beaded bags and moccasins. As an undergraduate, Maybee took a class in the philosophy of childhood and began to develop a children’s story that became the basis for his books. The artwork was inspired by ledger art. One book is about a young boy and his father. It has rawhide covers with acrylic painting and beadwork. The second is about a young girl and her mother. Through Nov. 20, the book covers, an explanation of their meaning and Maybee’s show ribbons are on display in the foyer of the Ross-Blakley Law Library at the Sandra Day O’Connor College of Law. The stories are being held behind the library’s front counter; to read them, just ask one of the librarians.Maybee was stunned when he found he had won Best in Show. “It was an incredibly humbling experience to win Best of Show,” Maybee said. “To be considered for the award, in the midst of so many fantastic artists, artists I admire and have looked up to for so many years was an emotional experience. Maybee, who worked at a law firm the summer before entering law school, is discussing a publishing deal to produce the books commercially.Maybee earned a bachelor’s degree in philosophy and has begun work on a master’s in fine arts from the University of California at Los Angeles. He decided to go to law school after working as a tribal police office. The Agua Caliente Band of Cahuilla Indians Legal Department Is looking for qualified candidates for the following position:Associate CounselAgua Caliente Band of Cahuilla Indians (ACBCI) is searching for an Associate Counsel. The Associate Counsel will be primarily responsible for providing legal advice to the Tribal Council, Administration, departments, and committees in structuring, documenting, and drafting documents related to commercial real estate transactions, working with the BIA on matters involving Indian trust lands, and contract drafting and review. The successful candidate will have experience in structuring, documenting, and drafting instruments related to commercial real estate transactions; contract drafting and review; NEPA/CEQA; BIA leasing procedures and related CFR’s; knowledgeable in ILCA a plus; strong communication, writing and interpersonal skills; a positive attitude; strong work ethic; electronic research skills and the ability to handle multiple matters.Salary Range: 89,000 or (DOE)Requirements:- Member in good standing of a state bar with preference given to those licensed in the State of California- Minimum of 3 years experience as a licensed attorney in transactional matters, including commercial real estate, contract drafting and review, and leasing of Indian lands- Membership in a federally-recognized Indian tribe is preferable, but not essentialCandidates will be subject to a thorough background check. Compensation is negotiable and will be commensurate with background and experience. Description: Under general supervision of the General Counsel, represents the Navajo Housing Authority in the courts of the Navajo Nation in Forcible Entry and Detainer cases and collection efforts. Advises the Chief Executive Officer, Chief Officers, Division Directors and other key management staff regarding legal matters, in accordance with the standard of ethics of the Navajo Nation Bar Association and all established standards, rules, regulations, and objectives of the Navajo Housing Authority. Maintains confidentially of privilege information.